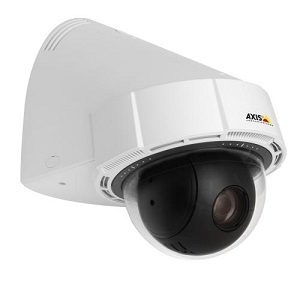 Axis has just released the affordable new P5414-E and P5415-E outdoor high definition PTZ (pan-tilt-zoom) cameras and they have definitely grabbed our attention. At a cost of approximately $1600 for the P5414-E (720p resolution) and $2000 for the P5415-E (1080p resolution) they are the least expensive high definition, outdoor PTZs ever created by Axis. They also boast terrific features (some of which are not normally found on a PTZ camera at this price point) including an 18x optical zoom lens, durable direct drive pan-tilt motors and connections for a microphone, speakers and alarm inputs. Wow! The camera is specifically designed for wall-mounting applications and the sleek, aesthetically pleasing, vandal resistant housing is paintable to blend even better with a building’s exterior. As always it’s backed up Axis’ unbeatable quality control and North American sales and technical support team. We’ll post an update when we’ve had a chance to put the P54 series through it’s paces. In the meantime you can get more information from Axis here.